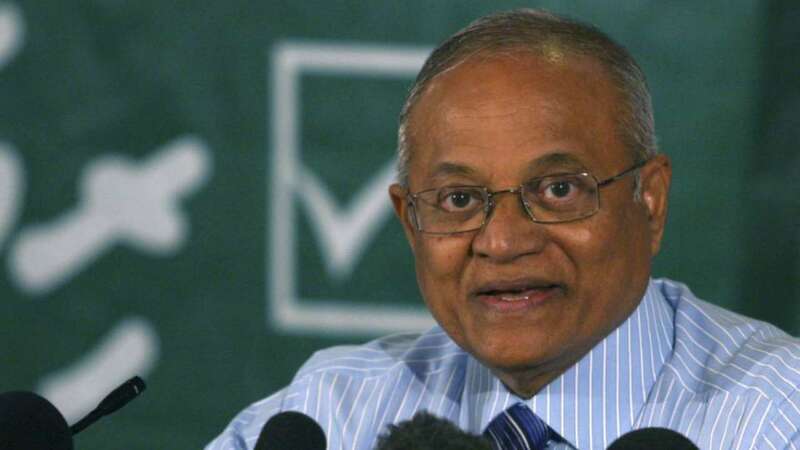 New Delhi has expressed "deep dismay" over the sentencing of former Maldives President Maumoon Abdul Gayoom and Chief Justice Abdulla Saeed "without a fair trail". New Delhi: Condemning the sentencing of former Maldives President Maumoon Abdul Gayoom and Chief Justice Abdulla Saeed “without a fair trial cast,” India said on Thursday that it has cast a doubt over Malé’s commitment to rule of law and therefore the entire presidential election process. The statement from India came just a day after Gayoom, Saeed and another Supreme Court Justice Ali Hameed were sentenced to one year, seven months and six days for obstructing justice by refusing to hand over their mobile phones for a police investigation. This condemnation from India was issued about three months after New Delhi had last publicly expressed concern to the Maldives following the revocation of emergency in March. Harking back to its position on the imposition of emergency, India said on Thursday that it has “repeatedly urged the government of the Maldives to allow all institutions, including the Supreme Court and the parliament, to function in a free and independent manner, and to permit genuine political dialogue between all political parties”. It added that this had also “been the demand of the international community at large”. Despite a boycott of the trial by defence lawyers, Gayoom, Saeed and Hameed were handed prison terms and stripped off their licenses to practice law and give religious sermons. Out of the eight prosecution witnesses, four gave secret testimonies, which Gayoom had protested to at the time of the sentencing by the Criminal Court. Defence witnesses were also not called by the judge. The three are already undergoing a trial on charges of terrorism in relation to the February 1 Supreme Court order which had called for the release of nine political prisoners. President Abdulla Yameen had claimed that the Supreme Court order had been a plot to overthrow his government and had triggered the declaration of a state of emergency. India’s statement not only expressed “deep dismay” with the trial and sentencing but also stated that it undermined trust in the Yameen government’s ability to conduct free and fair presidential elections in September. This is the first time that India has implied that the international acceptability of the presidential elections results if conducted without the presence of opposition leaders, should not be taken for granted. New Delhi demanded that Maldives government “should restore the credibility of the electoral and political process by immediately releasing political prisoners including former President Gayoom and Chief Justice Abdulla Saeed and creating the necessary conditions for the participation of all political forces in the presidential elections”. The Indian statement noted that a “democratic, stable and prosperous Maldives is in the interests of all its neighbours and friends in the Indian Ocean”. There has also been stringent criticism over the sentencing from US and UK. These defendants have now been convicted and sentenced. “Wherever law ends, tyranny begins, if the law be transgressed to another’s harm”, John Locke, 1689. This warning matters as much today as then. There has been considerable disquiet in New Delhi over the nose-dive in relations, which recently was demonstrated by the barring of entry to India to a key Yameen aide and leader of parliamentary ruling party group. At the annual press conference, external affairs minister Sushma Swaraj had said that she hadn’t visited the Maldives despite pending invitations as Malé had failed to keep its commitment on certain issues. The Maldivian opposition party MDP welcomed India’s “strongly worded statement” from India’s Ministry of External Affairs today. “It is clear as daylight that President Yameen intends to steal the upcoming presidential elections, by jailing all his opponents, preventing opposition candidates from contesting, and using the politicised Elections Commission to rig the vote,” said a MDP statement. In a late night reaction, the Maldives foreign ministry asserted that the sentencing had been carried out “as per national laws, regulations and procedures governing the criminal justice system in the Maldives”. “The Government of Maldives reiterates its commitment to upholding the rule of law and reassures that all criminal proceedings are carried out in compliance with the relevant laws and the Constitution of the Maldives,” it added. The latest response is much milder compared to their previous reaction in March, when the Maldives had described India’s statement as being without “genuine regard to facts and ground realities” and “not helpful at all to ensure a stable, peaceful and prosperous Maldives that meets the aspirations of its citizens”. Note: This article was updated on June 15 to include a statement from the Maldives foreign ministry.